From the earliest days of Castro’s rise to power in Cuba (on January 1, 1959), efforts to legitimize the revolution centered on delivering healthcare and education to underprivileged and underserved sectors of society, mostly in rural areas. As the Castro regime imposed a Marxist-Leninist model and command economy, free and universal healthcare became a critical pillar of the revolutionary project. After restructuring the economy and recovering from the exodus of many health professionals that occurred immediately after the revolutionary takeover, Cuba again achieved high indicators of human development such as in infant mortality, life expectancy, and doctors per capita.5 These accomplishments, aided by vigorous propagation efforts worldwide, earned Cuba accolades as a model in health and education.6 Serious questions and challenges remain as to whether these “achievements” are exaggerated or misrepresented as a result of propaganda, the manipulation of statistics, and distortions caused by heavy-handed control by a totalitarian state.7 But, that Cuba’s universal health and education systems enjoy an exceptionally favorable international opinion is clear. Cuba’s health diplomacy has grown congruent to that glowing reputation. It appears that soon after Hugo Chávez was elected President of Venezuela in 1999, Fidel Castro convinced him of the effectiveness of this peculiar mechanism. Chavez proceeded to greatly expand the initiative as part of a strengthening Venezuela-Cuba alliance.13 Two critical goals would be met with a robust health-for-oil program. First, to aid Cuba’s ailing economy and help keep the Castro dictatorship in power, Chávez would provide subsidized Venezuelan oil to Cuba in payment for the services of the internationalist brigades.14 Second, benefitting traditionally marginalized populations in Venezuela and other developing countries at little or no cost to the end recipients would greatly boost loyalty and support for the Chávez-Castro political agenda in the face of considerable resistance to their revolutionary Marxist project. The fast-tracked arrangements have benefitted Venezuela and other countries, including Bolivia Nicaragua, and Uruguay, which presumably do not pay for the services themselves. Countries whose leftist Presidents have strong ties to Venezuela and Cuba—Bolivia, Ecuador and Nicaragua—seem to be receiving the most favor and at no direct cost to them in order to “support revolutionary change,” as a U.S.-based supporter explains.25 In Bolivia, in particular, the program grew quickly. Public statements by Cuban government officials obscure the fact that Cuba actually receives payment for many of the medical services, at least those delivered in many countries. How much Cuba is paid for and how much it actually donates is difficult to pinpoint. What seems quite clear, however, is that Cuba does receive compensation, that in recent years most of it has come from Venezuela, and that it has grown to a very high percentage of Cuba’s GDP. Cuban health professionals serving abroad typically receive a miniscule fraction of the payment Cuba derives from the governments of countries where the health professionals render their services. Many cooperation agreements stipulate payment, a fact that is widely reported by local media and other sources in many recipient countries. Official Cuban sources indicate that “the host country provides accommodations and food, domestic transportation, a locale for work, and a monthly stipend (usually US$150– $200), while Cuban personnel receive their regular salaries, airfare and other logistical support from the Cuban health ministry.38 They do not clarify the source of the funds for Cuba’s outlays. Because in Cuba, the entire economy, including the health sector, is in the state’s hands, doctors may not practice privately. Pay from their sole employer, the state, barely guarantees subsistence. A doctor who chose to go work in Venezuela in 2006 explained that in Cuba he supplemented his meager salary of 475 Cuban pesos (around US$21.50) by raising pigs and egg-laying hens, though this could have landed him in jail.47 His salary, he insisted, was not enough to live.48 Similar stories are heard from many other doctors. The Trafficking in Persons Protocol, which went into force in 2003, but that Cuba has not signed.80 The Protocol states that “Trafficking in persons means “the recruitment, transportation, transfer, harbouring or receipt of persons, by means of the threat or use of force or other forms of coercion, …of the abuse of power or of a position of vulnerability or of the giving or receiving of payments or benefits to achieve the consent of a person, for the purpose of exploitation.” (Art. 3, subparagraph a). It also states that: “The consent of the victim to the intended exploitation is irrelevant once it is demonstrated that deception, coercion, force or other prohibited means have been used.” (Art. 3 subparagraph b) In addition it clarifies that exploitation may take the form of labour trafficking. “Exploitation shall include, at a minimum, …forced labour or services, slavery or practices similar to slavery, servitude…” (Art. 3 subparagraph a). The massive and accelerated training of Cuban doctors and health professionals, particularly in recent years, is only possible in a state-controlled society like Cuba, where the government is the sole employer and strictly controls the educational system and the workforce. The anger and frustration of Cuba’s citizens over the paradoxical state of affairs detailed above can find no outlet in their national media or corrected through civil society activism. In Cuba, there is no freedom of press, political dissent is not tolerated, a change of leadership is not possible, and the Communist party and its mass organizations are the only legal venues for political association. In Latin America in particular, the compassion of Hugo Chávez and Fidel Castro is constantly emphasized together with the official sponsorship of the program as part of the Bolivarian Alternative for the Americas (ALBA).115 The ALBA seeks the political, economic, and social integration of Caribbean and Latin American countries in “an alternative model to neoliberalism,”116 essentially meaning Marxism-Leninism. Not surprisingly, the proselytizing component of the internationalist missions is well documented. Feinsilver also points to Cuba’s long-standing investment in medical diplomacy as pursuing the accumulation of symbolic capital (prestige, influence and goodwill) that would be converted into material capital in the form of trade and aid. It is no secret that, in contrast with worldwide cries to boycott authoritarian regimes such as South Africa and Chile, Cuba trades and receives foreign investment from most of the world. This certainly had opened the door for the February 2010 arrival of Cuban Minister Ramiro Valdés for a reported long stay as “consultant.”134 Regarded as the third ranking member of Cuba’s ruling elite, Valdés’ official mandate was to head a commission to resolve Venezuela’s acute electricity shortage. But he lacked expertise in that field and Cuba has little to offer given its infamous 12–hour blackouts. But the 77–year old Valdés did have plenty of experience “managing the repressive organs of a police state.”135 Having established Cuba’s ruthless political police in the 60s and having served as Interior Minister twice, his most recent job in Cuba was Minister of Communications, where he policed Cubans’ access to the internet. 1. Cuba has sent professionals and technicians mostly in the field of healthcare, but also teachers, engineers, architects, and specialists in other fields. 2. Miguel Cabrera Peña, “La Nueva Operación Carlota,” Entrevista a Francisco León, Revista Encuentro, Nro. 43, invierno de 2006/ 07. 3. Julie Feinsilver, Healing the Masses: Cuban Health Politics at Home and Abroad (Berkeley and Los Angeles: University of California Press, 1993) 163. 4. Julie Feinsilver, U.S. author of a major work on Cuban health politics, fittingly calls this “symbolic capital.” Ibid. 5. Feinsilver indicates that it is “symbolically important for Cuba to compare favorably with the U.S. in an effort to demonstrate what Fidel sees as the moral superiority of Cuba’s social development policies.” Julie Feinsilver, “The Cuban Threat: Medical Diplomacy,” 1 November 2006. Scoop Independent News, http://www.scoop.co.nz/stories/WO0611/S00005.htm. 6. By the 1950s, Cuba enjoyed very high levels of health and education by Latin American standards and, in some instances, by world standards. For example, according to United Nations statistics, Cuba’s infant mortality rate of 32 per 1,000 live births in 1957 was the lowest in Latin America and the 13th lowest in the world. In 1957 Cuba ranked third in Latin America with respect to physicians and dentists per capita, behind only Uruguay and Argentina—both more advanced than the United States in this measure. Cuba’s 128 physicians and dentists per 100,000 people in 1957 was the same as the Netherlands, and ahead of the United Kingdom (122 per 100,000 people) and Finland (96). See “Zenith And Eclipse: A Comparative Look at Socio-Economic Conditions in Pre-Castro and Present Day Cuba,” Bureau of Inter-American Affairs, U.S. Department of State, January 12, 1998 <http://www.globalsecurity.org/wmd/library/ news/cuba/wwwh0013.htm>. 7. The literature on this is extensive. See for example Jay Nordlinger, “The Myth of Cuban Health Care,” National Review Online, July 30, 2007; Dr. Darsi Ferrer, “The Cuban Health System After Half a Century of Revolution,” Havana, May 8, 2009. 8. “Cuba & the Global Health Workforce,” citing: Memo to Gail Reed from Dr. R. Bagarotti, Unidad de Colaboración Médica, Ministry of Public Health, Havana, March, 2004. 11. “Los pueblos dirán la última palabra,” Versiones Taquigráficas, Consejo de Estado (“Cuba demanda sustitución de organismos financieros internacionales,” Prensa Latina, La Habana, 5 febrero 2003.) Discurso pronunciado por el Comandante en Jefe Fidel Castro Ruz, Santiago de Cuba, 26 de julio del 2003. http://www.jrebelde.cubaweb.cu /2003/julio_septiembre/jul-27/lospueblos.html. 12. Steve Brouwer, ‘The Cuban Revolutionary Doctor: The Ultimate Weapon of Solidarity,” Monthly Review, January 2009. http:// www.monthlyreview.org/090112brouwer.php. Brouwer is citing Granma, November 3, 2008. 13. In 2000 Cuba and Venezuela signed their first cooperation agreement, which established the basis for what has been a growing and strengthening economic and political alliance. 14. Fidel Castro had already used Cuban medical services as “payment” in the case, for example, of the former Soviet Union, with which Cuba had a debt of over US$20 billion in addition to having received huge direct assistance over nearly three decades. At the end of 1989, as the Soviet Union was leaving Communism behind and pressuring Cuba for repayment, Castro offered to treat children from Russian and Ukraine victims of radiation from the Chernobyl nuclear accident, reportedly free of charge. Some analysts believe there was more to it than humanitarian concern. By 2009, 24,000 Chernobyl victims had been treated. The program has evolved into a cooperation agreement between Cuba and Ukraine whereby Ukraine continues to cover transportation and will begin assigning US$800,000 each year to cover costs, but Cuba’s costs are estimated to be much higher and the services provided in Cuba would allegedly be much more expensive at home. (Feinsilver 2006, 166; Ukraine to Help Fund Cuban Program for Chernobyl Children, http:// www.ahora.cu/english /index. php?option=com_conten…; Andres Schipani, Children of Chernobyl find sanctuary in Cuba, The Age (Australia), July 4, 2009; Patricia Grogg, Chernobyl Kids Keep Arriving in Cuba, IPS/IFEJ, Havana, May 7, 2009, http://ipsnews.net/ news.asp?idnews=46754..
15. In 2008 Venezuela exported 115,000 barrels of crude oil to Cuba per day, part of which was payable in 90 days, the rest could be deferred and was financed by Venezuela for 25 years at 1% interest with a 2 year grace period. Financing was 40% when oil prices were over US$50 a barrel, 50% when over US$80 a barrel, and 60% when over US$100). (Rolando H. Castañeda, “La ayuda económica de Venezuela a Cuba: Situación y Perspectivas, ¿Es sostenible?,” Cuba in Transition—Volume 19 (Washington: Association for the Study of the Cuban Economy, 2009). Cuba can pay for oil imports with the services of Cuban health professionals, teachers, sports trainers, tourism and exchange students that Cuba sends to Venezuela and other countries as part of its alliance with Venezuela in the ALBA (Bolivarian Alliance), but it is not clear exactly how this works. 16. Marc Lifsher, “Cuban Doctors in Venezuela Add To Rift Growing Between Classes,” The Wall Street Journal, May 13, 2002. 17. The Pan-American World Health Organization reported that 84,797 Cuban health “collaborators” served abroad during the period 2001–2005: 4,317 in 2001, 6,190 in 2002, 17,033 in 2003, 26,014 in 2004 and 31,243 in 2005. (PAHO, Vol. II, Cuadro 5, p. 284 http://www.paho.org/hia/archivosvol2/paisesesp /Cuba%20 Spanish.pdf#search =%22 cuba%22). 18. “MinSalud desmiente a Provea: 30 mil médicos, odontólogos y técnicos cubanos están en Venezuela,” 10 diciembre 2008, http:// www.radiomundial.com.ve/yvke/noticia.php?t=16023. 19. “Cubanos en Venezuela: ¿Ayuda o interferencia?,” Caracas, Associated Press, May 31, 2010. 23. Personal interview with a Cuban doctor who defected from Venezuela in August 2009, New Jersey, November 21, 2009. The name is withheld to protect family members in Cuba. The clinic where this doctor worked, in a state near the capital, was staffed with around 20 Cuban doctors, some of whom also trained 22 Venezuelan students completing their 5th year of medicine studies (they graduate after completing 6 years). 24. “Cuba & the Global Health Workforce,” citing: “Mirando al futuro desde la Cooperación Internacional,” Power Point presentation by Dr. Yiliam Jiménez, 26 June 2006, Havana. 26. “Médicos cubanos ayudan a campesinos de Bolivia,” Associated Press, La Paz, 24 de abril de 2006. 27. Fidel Castro Ruz, 25 de Abril del 2008, digital@juventudrebelde.cu. 28. As reported in the Cuban official press. See Alfredo Boada, “Operación Milagro: La cura de millones de latinoamericanos,” Agencia Prensa Latina, La Habana, 7 diciembre del 2006. 29. Public reporting on who the donor is varies. In Cuba’s official press, Cuba is usually presented as the donor, as Cuban personnel staffs the facilities and inputs come from Cuba. Nonetheless, presumably Venezuela is providing the funding. The Venezuelan role is publicized depending on the venue. The “Misión Milagro,” for example, is openly presented as a joint Cuba-Venezuela initiative. 30. “Médicos cubanos operarán de la vista gratis a 12.000 panameños,” EFE (Terra Actualidad), 22 de noviembre de 2005. 33. “Operados 90 mil ecuatorianos por médicos cubanos de la Misión Milagro,” Prensa Latina, Quito, 26 de julio de 2009. Cuba Coopera, http://www.cubacoop.com/cubacoop/2009/09–07–28–Operados.html. 36. Mirta Ojito, “Cuba reaps goodwill from doctor diplomacy,” The Miami Herald, August 17, 2009. 37. Cuba & the Global Health Workforce: Health Professionals Abroad (Website for the film Salud), http://www.saludthefilm.net/ns/ index.html. 41. Lorenzo L. Pérez, “The Impact of the Global Financial and Economic Crisis on Cuba,” Cuba in Transition—Volume 19 (Washington: Association for the Study of the Cuban Economy, 2009. 42. Tourism revenues in 2008 totalled US$2.4 billion. (Anuario Estadístico de Cuba, http://www.one.cu/). 43. Telephone interview with Cuban doctor, name withheld to protect family in Cuba, 11/24/2009. 44. Article 216 of Cuba’s Penal Code (Ley No. 62, 29/12/1987) forbids citizens from leaving the country without government permission and punishes attempts to do so with1 to 3 years of prison. Average citizens must face a restrictive, onerous and very costly procedure to obtain authorization to travel. This is in open violation of the Universal Declaration of Human Rights as well as numerous international agreements and customary law. 46. As related to the author by several doctors in exile on a number of occasions. 48. Personal interview with Cuban doctor, 11/21/09. 49. Juan Forero, “Cubans on Medical Aid Mission Flee Venezuela, but Find Limbo,” The Washington Post, February 20, 2007, A7. 53. Personal interview with Cuban doctor, 11/21/09. 54. A Cuban doctor working in Venezuela from 2006 until August 2009 reported that his family in Cuba received US$50 per month the first 2 years he was abroad, an amount that increased to US$100 monthly after that. In addition, US$125 per month was deposited in a special account in Cuba for the first six months of service, an amount that increased to US$225 per month until the 24th month of service and to US$325 per month after that. This fund is only made available if the doctor returns to Cuba in good standing after having completed the mission successfully. (Personal interview with Cuban doctor, 11/21/09.) Another doctor who served nine months in Venezuela until arriving in the U.S. in August 2008 reported that his family in Cuba had received monthly US$50 plus his old salary of 505 Cuban Pesos, equivalent to around US$22. In addition, his reserve fund would have accumulated around US$2,000 in the first year, but he forfeited that amount by leaving for the U.S. while serving in Venezuela. In the first three months of his stay, his monthly stipend was 715 bolivares, out of which 50 were subtracted on the spot for a “common fund,” an amount insufficient for his food and basic necessities. (Dr. Keiler Moreno, Telephone interview, January 9, 2010.) This net monthly stipend of 660 bolivares was equivalent to US$307. 56. 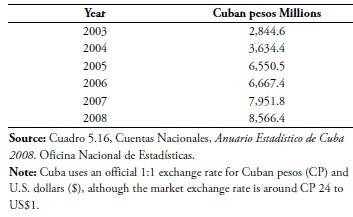 This assumes that Cuba reports export of services including tourism revenues, although that is not a certainty. According to a Reuters report filed from Havana: “Cuba does not specify what it includes within the service export category, though officials have said tourism and related revenues, the export of medical and other technical services and donations fall within it.” (Mark Frank, “Cuba says exports of services tops $9 billion,” Reuters (posted in Havana Journal as “Export of Cuba services generate $9billion in 2008 but numbers are suspect,” January 8, 2008 http://havanajournal.com/business/entry/cuba-says-export-of-services-generate-9billion-in-2008– but-numbers-are-susp/). 58. Other economists have calculated that Cuba is receiving from Venezuela the equivalent of US$220,500 per health professional per year. See Castañeda, who also cites renowned economist expert on Cuba, Carmelo Mesa Lago. 62. “Chávez pide perdón a Cuba por asalto y ultraje de dos médicas en Venezuela,” Caracas, Punto de Noticias / EFE, 13 Noviembre 2005. 64. Dr. Keiler Moreno lived by himself in an attic-type facility over the small clinic he staffed in Miranda state in Venezuela from November 2008 to August 2009. He reports that the ceiling was so low he would hit his head if he stood up and the heat was so stifling he could not remain in his room. The conditions, he said, were the worst he had endured, and this was after living in Cuba, including serving one year alone in a remote rural clinic in the Sierra Maestra. 65. Personal interview with Cuban doctor, 11/21/2009. 66. A Cuban doctor referred to it as Law 38, but the author has been unable to obtain the text of this law or regulation. 68. Ojito and personal interview with Cuban doctor, 11/21/09. 71. Telephone interview with Dr. J. Alfonso. 73. Personal interview with Cuban doctor, 11/21/09. 74. In August 2006, the United States announced the “Cuban Medical Professional Parole Program” (CMPP), to grant Cuban doctors, nurses, administrators, lab technicians and other professionals working in third countries under the direction of the Cuban government entry into the U.S. Technically, they are “paroled” by the U.S. Citizenship and Immigration Services, which exercises its discretionary authority to parole an alien into the United States for urgent humanitarian reasons or significant public benefit. (See Fact Sheet: “Cuban Medical Professional Parole Program,” Department of State, January 26, 2009, http://www.state.gov/p/wha/rls/fs/2009/ 115414.htm.) The Cubans must apply at their host country’s U.S. embassy; after undergoing a background check, most applicants are reportedly accepted. (Tal Abbady, “Hundreds of Cuban medical workers defecting to U.S. while overseas,” Sun-Sentinel, October 10, 2007.) At least 500 doctors have escaped in Venezuela in recent years. (”E.U. rechaza a médicos cubanos que desertaron en Venezuela,” Associated Press, Bogota, 4 febrero 2007.) The parole gives those admitted legal status that allows them to work and one year later they are eligible for full residency. Numerous media and other reports have been filed on the defections, many in recipient countries. See for example: Susan Kitchens, “Castro’s Medical Mercenaries,” Forbes, November 14, 2005; Todd Bensman, “Cuba uses humanitarian aid in fight for foothold in Africa,” The Dallas Morning News (Luanda, Angola), May 9, 1999, p. 14A; Mijail Barzaga Lugo, “Reality Different Than Expected for Cuban Physician,” CubaNet, Havana, February 8, 2000, (UPECI, February 5, 2000; Webster Malido, “Cuban Envoy Explains Conditions Of Its Docs,” The Post of Zambia (Lusaka), Africa News Online, July 6, 2000; Chris Gaither and Sandra Márquez García, “Cuban doctors vanish in Zimbabwe,” The Miami Herald, June 6, 2000; Stephen Dudley, “Cuban doctors defect, speak out,” The Miami Herald, Cartagena, Colombia, 15 August 2006; Héctor Maseda, “Esclavos internacionales,” CubaNet, La Habana, 14 marzo 2003; Guillermo Fariñas Hernández, Cubanacán Press, “Médico de Villa Clara critica planes de salud en reunión oficial,” Santa Clara, 26 de abril 2004 (www.cubanet.org). 75. “Al menos dos mil médicos cubanos han huído desde Venezuela a EE.UU. vía Colombia,” EFE, Bogotá, 18 abril 2010; “Médicos cubanos que trabajan en Venezuela huyen del régimen de Castro a través de Colombia,” El Tiempo, 18 de abril de 2010; “Un ‘Ángel de la libertad’ venezolano ayuda a los cubanos a salir por Cúcuta,” El Tiempo, 18 de abril de 2010. 76. A recent deserter from Venezuela claimed he only paid US$50 plus 300 bolivares to airport customs’ representatives, as this is what he had on him. However, another defecting doctor leaving on the same flight for Miami paid US$300 while a friend who left earlier had paid US$800. (Personal interview with Cuban doctor, 11/21/09.) Also see, “Médicos cubanos logran desertar desde Venezuela tras sobornar a funcionarios,” EFE, 7 enero 2010; Casto Ocando, “Médicos cubanos compran su fuga desde Venezuela,” El Nuevo Herald, 7 enero 2010: “Un médico cubano objeto de trato cruel, inhumano y degradante en el aeropuerto de Maiquetía, Venezuela,” Medicina cubana, 6 enero 2010 , http://medicinacubana.blogspot.com/2010/01/un-medico-cubano-objeto-de-trato-cruel_06.html. 77. “Reporte de Violaciones Laborales Cometidas por el Gobierno Cubano,” julio 2009, Grupo Internacional Para la Responsabilidad Social Corporativa en Cuba, http://www.cubasindical.org/docs/reporte2009GIRSCC.pdf. 78. Direct citations from the report: “The State controls the labour market and decides on pay and working conditions in the State sector.” “Freedom of association is restricted and collective bargaining and the right to strike are not recognised by law.” “The government explicitly prohibits independent trade unions.” “Workers can only belong to the single trade union.” “The country has a unique system of labour relations, with the State playing the role of all social actors.” “The bodies that deal with the administration of labour are also part of the leadership structures of the State apparatus.” “There is no legislation covering the right to strike” and actual practices and regulations are “tantamount to denying the right to strike, according to international labour standards.” “Labour disputes are settled by State institutions.” International Trade Union Confederation (ITUC), Annual Survey of Violations of Trade Union Rights 2009, http://www.cubasindical.org/docs/d06100901_e.htm. 79. Although it is clear to the author that Cuba’s international medical missions are in violation of international agreements and standards and numerous individuals and groups have denounced this—including at the United Nations and the ILO—the author is not aware of any rulings by international organizations or tribunals that specifically cite Cuba as violating international rules. In addition, although claims against Cuba have been brought in local courts in several countries relative to the international medical missions, the author is unaware of any rulings finding Cuba in violation of international agreements. 80. Protocol to Prevent, Suppress and Punish Trafficking in Persons, Especially Women And Children, Supplementing the United Nations Convention Against Transnational Organized Crime. The Convention was adopted by resolution A/RES/55/25 of 15 November 2000 at the fifty-fifth session of the General Assembly of the United Nations and entered into force December 25, 2003. Cuba ratified the Convention on 9 Feb 2007, but had not ratified the Protocol as of Sept. 10, 2010 (United Nations Treaty Collection, STATUS AS AT: 09–10–2010 < http://treaties.un.org>). 81. Convention Concerning the Protection of Wages (No. 95), adopted 1/7/1952, which went into force on 9/24/1952 and was ratified by Cuba on 4/29/1952. This Convention was partially revised in 1992 by Convention No. 173.See ILOLEX – database of International Labour Standards and recommendations, including ratification information. http://www.ilo.org/ilolex/cgi-lex/convde.pl?C095 and http://www.ilo.org/ilolex/english/convdisp1.htm.. Cuba is a member of the ILO, which has standards to protect workers with respect to freedom of association, collective bargaining, wages, working time, occupational safety and others, that would serve as guidelines for an assessment. 82. ILO Convention 29 Concerning Forced or Compulsory Labour, adopted in Geneva on 5/28/1930, entered in force on 1/5/1932, and ratified by Cuba on 7/20/1953. http://www.ilo.org/ilolex/english/convdisp1.htm. 83. Combating Trafficking in Personas: A Handbook for Parlamentarians, United Nations, No. 16, 2009. 84. League of Nations 1929 Slavery, Servitude, Forced Labour and Similar Institutions and Practices Convention. 85. “Medical Workers File Suit Against Cuba/Venezuela,”CBS News, Miami, February 22, 2010; “Siete médicos cubanos demandan a Cuba y Venezuela por ‘esclavitud moderna,’” EFE/El Nuevo Herald, 22 febrero 2010. 86. Brouwer. Figures for Western Europe and the United States are from the OECD. 87. “Cuba & the Global Health Workforce,” citing: Gail Reed. Challenges for Cuba’s Family Doctor-and-Nurse Program. In MEDICC Review, Vol 11 No 3, 2000; Castro, F. Speech at national medical school graduation ceremonies, August 13, 2003 (unpublished transcript); and Health Human Resources Trends in the Americas: Evidence for Action, Pan American Health Organization Human Resources for Health Unit, September 2006, Washington DC., p. 6. 89. Pablo Bachelet, “U.S. program for defecting Cuban doctors a success,” The Miami Herald, March 11, 2007. 91. Hilda Molina, “El mito del sistema de salud cubano: un testimonio personal,” 22 mayo 2006. Cato Institute, http://www.elcato. org/publicaciones/ensayos/ens-2006–05–22.html..
92. “Médicos bolivianos dicen que colegas cubanos no deberían ejercer,” Terra España, 11 de marzo de 2006. Mery Vaca, “Medicina gratis como protesta,” BBC, La Paz, Bolivia, 16 de agosto de 2006, http://news.bbc.co.uk/hi/spanish/ latin_america/newsid_4796000/ 4796971.stm. 93. “Uruguay no suspenderá los viajes a Cuba para cirugías oculares,” AFP, Punto de Noticias, 28 de mayo de 2006. “Oftalmólogos cubanos dispuestos a ir a la cárcel en Uruguay, dijo Fidel Castro,” 11 de junio, 2006 – Año 10 – Nro.2216, http://www.larepublica. com.uy/politica/213636–oftalmologos-cubanos-dispuestos-a-ir-a-la-carcel-en-uruguay-dijo-fidel-castro. 94. “Gremio de médicos de Panamá rechazó contratación de oftalmólogos cubanos,” AFP, Panama, March 2, 2007. 95. “Médicos cubanos ‘son amenaza’ para salud de trinitarios,” El Universal, Venezuela, octubre 4 de 2003. 97. As reported by Dr. Julio Cesar Alfonso (telephone interview). 98. Víctor Llano, “Propiedad del gobierno,” Libertad Digital, Opinión, 8 de marzo del 2003, http://www.libertaddigital.com/php3/ opi_desa.php3?cpn=12667. 99. “Medical Journal Exposes Cuba’s Failed ‘Doctor’Diplomacy,’” Washington, U.S. Newswire, Association of American Physicians and Surgeons, October 12, 2000. 100. Personal interview with Cuban doctor, 11/21/09. 101. Stephanie Nieuwoudt, “South Africa: Cuban doctors provide care in far-flung regions,” IPS/GIN, Cape Town, South Africa, April 28, 2008. 102. “Médicos cubanos vuelven a La Habana por decisión judicial,” Terra España, 15 de abril de 2005. 103. “Venezuela: fallo contra médicos cubanos,” 22 agosto 2003, BBCMundo.com, http://news.bbc.co.uk/go/pr/fr/-/hi/spanish/ latin_america/newsid_3173000/3173645.stm. 105. Foreign graduates from the medical schools in Cuba, however, must take Cuba’s National Final Examinations, proceed to complete an internship in their home countries, take the local qualifying exam and have their credentials validated there. Ibid. 106. Wilfredo Cancio Isla, “En crisis la salud en Cuba por misiones de médicos,” El Nuevo Herald, 6 enero 2006. Numerous independent journalist reports are regularly filed on this matter. See, for example, Marta Beatriz Roque, “No hay especialistas,” La Habana, Red de Comunicadores, www.cubanet.org, 7 de enero 2010. 107. Francisco Chaviano González, “El abuso contra los médicos cubanos,” La Habana, Agenda Cambio-Debate / www.cubanet.org, 11 de junio 2010. 108. These accounts are frequently filed by independent journalists in Cuba and are available in Cubanet.org, in the Independent Press section. 109. Several personal and telephone interviews conducted with three recently exiled Cuban doctors, November and December 2009 and January 2010. 111. The Miami Herald, 10 January 2007. 115. “Alternativa Bolivariana para las Américas” (ALBA), in Spanish. Cuba’s officials and the Cuban media consistently report on the medical programs and international missions within the context of ALBA. 116. The stated purpose of this alternative model is “to correct the disparities and disadvantage of underdeveloped countries compared to the developed countries.” Fernando Ramón Bossi, “Constructing the ALBA from within the peoples.” http://www.alternativabolivariana. org/modules.php?name=Content&pa=showpage&pid=258. 118. Fidel Castro, “Christians without Bibles,” Prensa Latina, Havana, March, 3 2008. http://www.plenglish.com/article. asp?ID=%7BF9191053–F754–499C-9B65–157F7928DEAE%7D)&language=EN. 120. The Miami Herald, Staff Report, 10 January 2007. 121. “Retornan los paraguayos que fueron a Cuba para cirugías del ojo,” ABC Color Digital, Paraguay, 13 noviembre 2005. 122. “El viaje a Cuba cuesta 10 veces más que las cirugías en Paraguay,” ABC Color Digital, Uruguay, 6 noviembre 2005. 123. “Luego de casi un mes, llegan paraguayos que fueron a Cuba,” ABC Color Digital, Paraguay, 7 de diciembre de 2005. 126. Ojito and personal interview with Cuban doctor, 11/21/09. 127. Stephen Dudley, “Cuban doctors defect, speak out,” The Miami Herald, Cartagena, Colombia, 15 August 2006. 128. Personal interview with Cuban doctor, 11/21/09. 130. Marc Lifsher, “Cuban Doctors in Venezuela Add To Rift Growing Between Classes,” The Wall Street Journal, May 13, 2002. 132. Álvaro Yero Felipe, “Médicos o policías,” La Habana, 7 de noviembre de 2009, www.PayoLibre.com. 133. “Cubanos en Venezuela: ¿Ayuda o interferencia?” Caracas, Associated Press, May 31, 2010. 134. See, for example, Christopher Toothaker, “Venezuela’s Chavez turns to Cuban help with energy crisis, baffling critics,” Associated Press, Caracas, February 3, 2010. 135. Jaime Daremblum, “The Cubanization of Venezuela,” The Weekly Standard, Vol. 15 No. 24, March 8, 2010. 136. Martin Arostegui, “Cuban Advisers Bolster Venezuelan Regime,” The Washington Times, April 6, 2010. “Cubanos en Venezuela: ¿Ayuda o interferencia?,” Associated Press (AP), Caracas, 31 de mayo de 2010. Roberto Koltun, “Presencia de cubanos en ‘áreas sensibles’ atenta contra el Estado,” El Universal, Caracas, 09 de enero, 2010. 137. Simon Romero, “Venezuela’s Military Ties with Cuba Stir Concerns,” The New York Times, June 14, 2010. Ian James, “Ex-general: Cubans involved in Chavez’s military,” Caracas, 4/22/2010. 138. “Venecuba, a single nation,” The Economist, February 11, 2010. 139. Carlos Alberto Montaner, “Quién encarceló a Oswaldo Alvarez Paz,” El Nuevo Herald, 3/28/10.